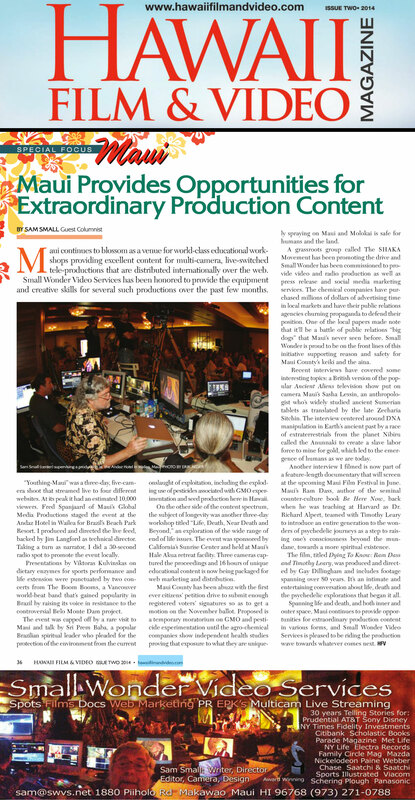 Maui continues to blossom as a venue for world-class educational workshops providing excellent content for multi-camera, live-switched tele-productions that are distributed internationally over the web. Small Wonder Video Services has been honored to provide the equipment and creative skills for several such productions over the past few months. “Youthing-Maui” was a three-day, five-camera shoot, that streamed live to four different websites and at its peak, an estimated 10,000 viewers. Fred Spanjaard of Maui’s Global Media Productions staged the event at the luxurious Andaz Hotel in Wialea, for Brazil’s Beach Park Resort. Sam Small produced and directed the live feed, backed by Jim Langford as technical director. Taking a turn as narrator, Sam voiced a :30 radio spot to promote the event locally. Presentations by Viktorus Kulvinskas on dietary enzymes for sports performance and life extension were punctuated by two concerts from The Boom Boom’s, a Vancouver world-beat band that’s gained popularity in Brazil by raising it’s voice in resistance to the controversial Belo Monte Dam project. The event was capped off by a rare visit to Maui and talk by Sri Prem Baba, a popular Brazilian spiritual leader, who pleaded for the protection of Mother Earth from the current onslaught of exploitation, including the exploding use of pesticides associated with GMO experimentation and seed production here in Hawaii. On the other side of the content spectrum from Longevity was another three-day workshop titled “ Life, Death, Near Death and Beyond”, an exploration of the wide range of End of Life issues. The event was sponsored by CA’s Sunrise Center, and held at Maui’s Hale Akua retreat facility. Three cameras captured the proceedings and 16 hours of unique educational content is now being packaged for web marketing and distribution. Maui County has been abuzz with the first ever citizen’s petition drive to submit enough registered voter’s signatures so as to get a motion on the November ballot. Proposed is a temporary moratorium on GMO and pesticide experimentation until the Agro-Chemical companies show independent health studies proving exposure to what they are uniquely spraying on Maui and Molokai is safe for humans and the land. Small Wonder has been commissioned to provide video and radio production as well as press release and social media marketing services. The chemical companies have purchased millions of dollars of advertising time in local markets and have their PR agencies churning propaganda to defend their position. One of the local papers made note that it’ll be a battle of public relations “Big Dogs” that Maui’s never seen before. Small Wonder is proud to be on the front line of this initiative supporting reason and safety for Maui County’s Keiki and the ‘Aina. Recent interviews shot by Sam Small have covered some interesting topics: a British version of the popular “Ancient Aliens” TV show put on camera Maui’s Sasha Lessin, Ph.D., an anthropologist who’s widely studied ancient Sumerian tablets as translated by the late Zecharia Sitchin. The interview centered around DNA manipulation in earth’s ancient past by a race of extra terrestrials from the planet Nibiru called the Anunnaki , to create a slave labor force to mine for gold and which led to the emergence of humans as we are today. And another interview Sam shot is now part of a feature length documentary that will open the upcoming Maui Film Festival June 4th. Maui’s Ram Dass, author of the seminal counter-culture book “Be Here Now”, back when he was teaching at Harvard as Dr. Richard Alpert, teamed with Timothy Leary to introduce an entire generation to the wonders of psychedelic journeys as a step to raising one’s consciousness beyond the mundane, towards a more spiritual existence. The film titled “Dying To Know: Ram Dass and Timothy Leary” was produced and directed by Gay Dillingham and includes footage spanning over 80 years. It’s an intimate and entertaining conversation about life, death and the psychedelic explorations that began it all.